Stag 15 M-LOK Pistol Kit 300 Blackout 8"
Submitted 11 months 2 weeks ago by Sam07. 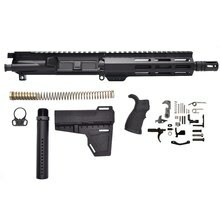 Chambered in .300 Blackout, the Stag Arms AR Pistol Kit is a Mil-Spec AR builders kit with everything you need minus a Stripped Lower Receiver. Built around a 8" 1/7 twist barrel with a pistol length gas system and a low profile gas block, the 4150 Chrome Moly Vanadium Steel barrels are QPQ treated for advanced case hardening that increases corrosion resistance and increases accuracy potential.